FunctionFox is growing again. As the leading provider of time and project tracking software for small creative companies, we are always looking to strengthen our team. 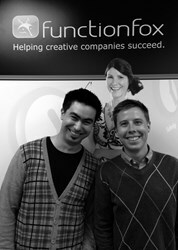 Recently, our expanding account- management group welcomed two new account managers: Corey Wesley and Michael Yarmack. Corey Wesley is passionate about communication. His educational background is in linguistics (BA University of Victoria) and professional communications (MA Royal Roads University), and he has a particular interest in discourse and social meaning in advertising. He has significant leadership and organizational experience, and knowledge of the needs and processes common in creative companies. This means that Corey is comfortable working in a dynamic, fast-paced work environment like that of FunctionFox, and that he has a deep understanding of the challenges our customers face. Michael Yarmack has a successful background in sales management, staff motivation, and sales training. With a bachelor’s degree in Marketing Business Management (Vancouver Island University) and an entrepreneurial spirit, Michael is drawn to new opportunities and value creation. Extremely self-motivated, he is effective in generating new business and building a strong customer base. His attention to detail and ability to learn new skills quickly will allow him to meet and exceed the expectations of our clients and prospects. "We are glad to have Michael and Corey join the FunctionFox team," says Robert Hitchen, Sales Manager at FunctionFox. "With their skills and experience, they will be assets to our company, and valuable resources for our customers and prospects." FunctionFox is the leading provider of time and project tracking software for small creative companies. TimeFox, its web-based timesheet and project management software, is the number one ranked time-tracking system in North America. Graphic design, advertising, communications, marketing, multimedia, public relations, and interactive firms all choose TimeFox as their web-based time and project management application. TimeFox is currently used by thousands of customers in Canada, the US, Europe, Asia, Australia and New Zealand.